You’re invited! I’m sure most everyone reading this blog grew up with Richard Scarry books. I know I did. 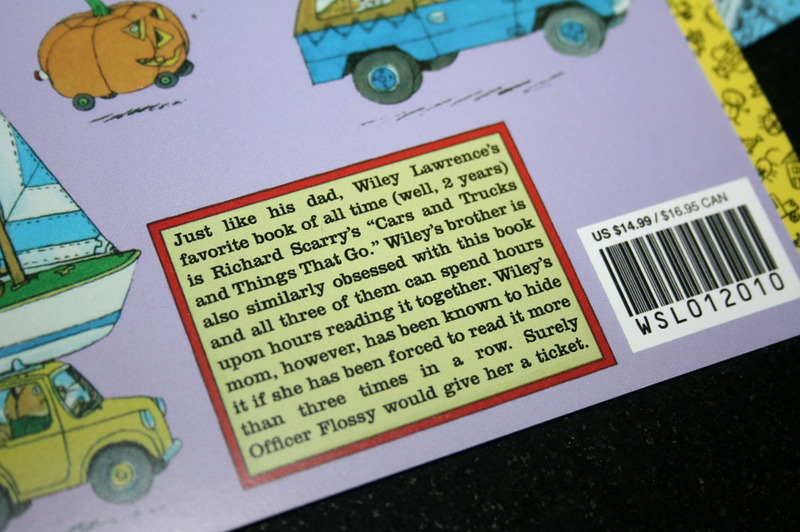 But I had no idea how seriously OBSESSED boys can be with Scarry’s “Cars and Trucks and Things That Go” book until I had my rugrats. (If you have a boy and you don’t yet have this book, seriously go out right now, spend the $9 and get it!) My husband apparently would ONLY read this book with his mom each night as a kid so I guess it’s in the genes, but both of my sons are seriously beyond the point of obsession and are quite possibly addicted to this book. It’s seriously awesome. My littlest guy is the most obsessed one in the bunch so there was no other theme choice when planning his birthday party. He literally talks about ‘pickle trucks’ at least 14 times a day. 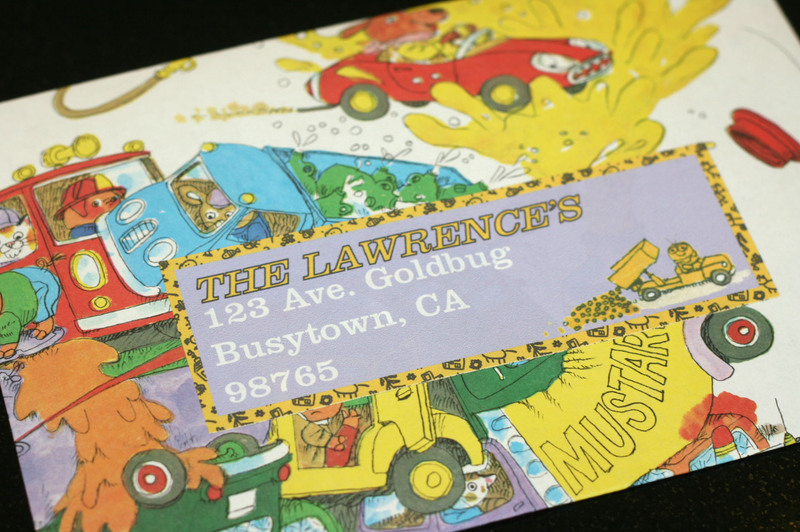 I know that Richard Scarry is having a bit of a resurgence – there’s “Busytown Mysteries” on TV and games all over the place lately – but I really wanted to keep the focus on this book specifically since it’s my wee one’s first love. I scanned in the both the front and back of the book itself and altered the wording, keeping the font choice the same as the book. Simple as that. 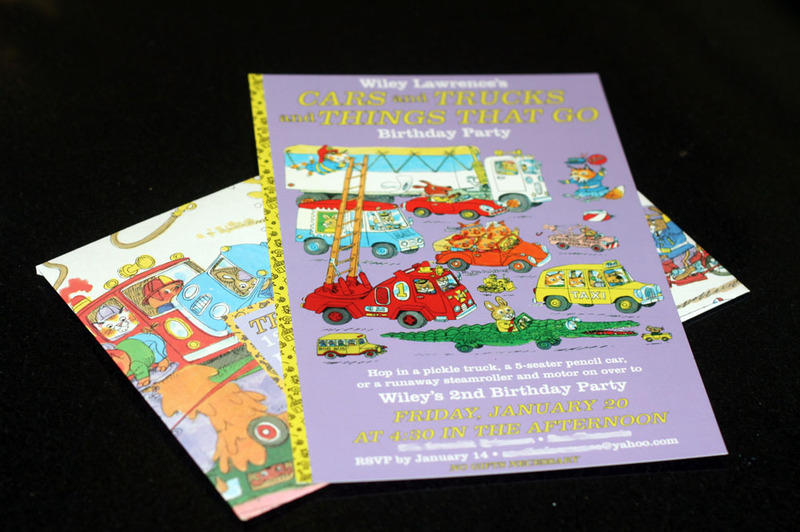 On the back of the book where there is normally a blurb about Richard Scarry, I chose to explain the reason we threw our little man this party. I changed the bar code to his initials WSL and his birthday 01.20.10. I’m such a dork at heart. 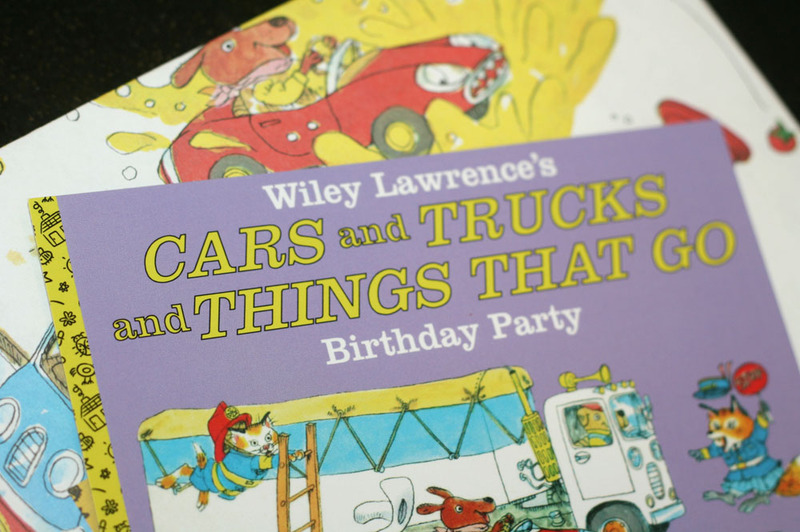 I bought about 5 used “Cars & Trucks…” books online for pennies and cut them up to use as envelopes (as well as throughout the party which you’ll see more of this week.) Every invitee had a different page wrapped around their invite. And that’s that! So… you’re invited to come check out this party this week! Hop in that pencil car of yours and come on along! 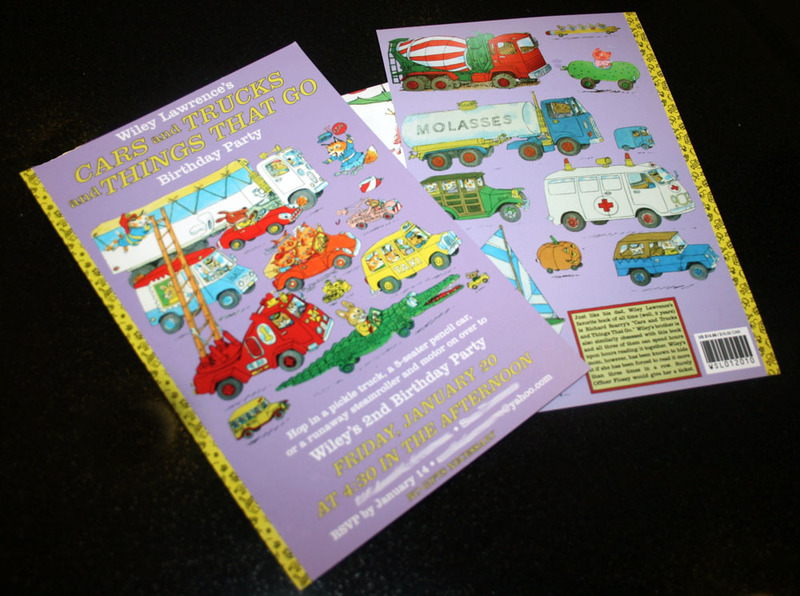 This entry was posted in kid's parties, parties for kiddos and tagged 2nd birthday party, boy's birthday theme, boy's party idea, busytown mysteries party, busytown party, cars & trucks and things that go party, cars & trucks party, lowly worm, richard scarry book, richard scarry party by Annika. Bookmark the permalink. Love this!!! 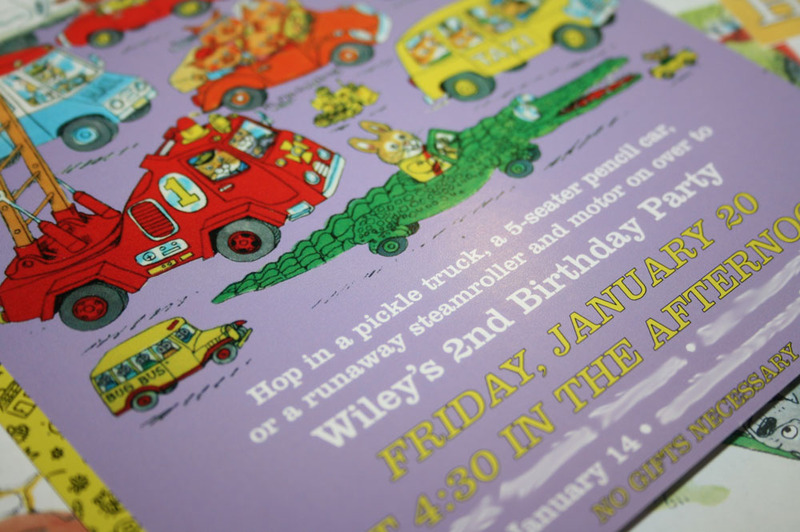 I am planning my son’ second birthday with a car, truck, and anything on wheels theme!!! I love this Annika, you are so creative! It was my boys favorite book too, and they knew if I skipped a page. And if I had thrown a party like this is would have been the favorite for sure!! Oh my gosh I hear you! And it is SUCH a long book so it’s a page-skipper for sure! Boys are sure serious when it comes to their Richard Scarry! 🙂 So cute that your boys loved it too! What font(s) did you use for the invitations? Thanks! !